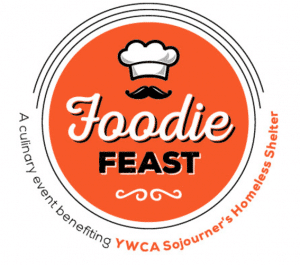 YWCA Raising Monies for Sojourner’s Shelter. The Annual Foodie Feast is Set. In 2016, YWCA Charleston revamped its annual Thanksgiving benefit dinner, which is now called Foodie Feast. After 30 years of hosting this event, which raises funds for the Sojourner’s Shelter for Homeless Women & Families, the YWCA and its marketing partner, Asher Agency, and event chair, Kirsten Mork, thought it was time for a change. Hosted by Paterno’s at the Park on the second Sunday in November, Foodie Feast is a brunch with a fresh, modern twist on a conventional Thanksgiving meal. Guests can sip a cocktail while sampling unique creations by local celebrity chefs mixed with sumptuous, traditional comfort foods made by Wellington’s. This year’s food fusions include butternut squash lasagna; turkey sliders with white cheddar and cranberry ketchup; buttermilk biscuits with pumpkin butter; vegetable frittatas; a mixed greens salad with candied pecans, apples and cranberry buttermilk dressing; and, new this year, turporken—chicken, turkey and bacon wrapped in a butterflied pork tenderloin. The comfort foods from Wellington’s include traditional Thanksgiving fare such as the restaurant’s famous bread pudding. Sojourner’s Shelter for Homeless Women & Families serves homeless single women, women with children, men with custody of their children, intact families and veterans. The program provides shelter, counseling, substance abuse intervention, educational advancement, job training and placement. In the last year, YWCA Sojourner’s provided 20,176 nights of shelter for 801 homeless children and adults. “We give them a bed and a reason to get out of it,” says Program Director Margaret Taylor. A program based on empowering people who want to get on their feet, Sojourner’s boasts a low return-to-shelter rate of 5 percent—well below the national average. As a special gift, top sponsors of this year’s Foodie Feast worked alongside chefs Tim Arden of Paterno’s at the Park and Paul Smith of Buzz Foods to serve a few items from the revamped menu to residents of the YWCA Sojourner’s Shelter on Tuesday night, October 23. Foodie Feast tickets are $50 for adults and include bloody marys and mimosas and $25 for kids and adults ages 11-20. Children under 11 eat free. Tickets can be purchased online at www.foodiefeastwv.com or at the event. Kate Flack is the communications and development director at YWCA Charleston, a comprehensive social services agency serving more than 5,000 people annually in Kanawha, Clay and Boone counties. She is a passionate advocate for social justice and embraces the mission of the YWCA: eliminating racism, empowering women and promoting peace, justice, freedom and dignity for all. In her spare time, she likes to hike with her husband, Adam; their young children, Atlas and Arden; and two West Virginia brown dogs, Samantha and Zaylee.